Beware what you wish for…… wanting sunshine, Teresa and I were delighted, if not a little surprised to get it yesterday and we loved it but I was reminded that we had also said ” we don’t care if it rains again as we’ve had this gorgeous day.” Well we woke to rain and it didn’t stop all day! See what I mean. We packed with enthusiasm this morning as we were delighted at the fact that we were leaving the Hotel Triana, don’t stay there if you have a choice at all. Breakfast, I’m glad to say was better that dinner but there was still a greasy small around and even though it was raining, we were out of there asap. I think it’s actually been the worst place we’ve stayed. As we headed off even the boulangerie was closed so no fresh bread, we just had to hope that there would be somewhere to get lunch. In the meantime, the rain continued and although we knew there were others on the same section, we didn’t see a soul. Consulting the books, the only place we could see that would offer solace was Manciet about 11kms ahead so we headed straight there at quite a pace too. Well there was no point stopping much and through the rain the scenery wasn’t that great either. Mud, rain and rivers, repeated over and over again so after a while we stopped worrying about finding the driest bits and just sloshed through. I don’t think I’ve ever been so muddy in my life. We arrived in Manciet about 12.00 to find an open boulangerie and a cafe, what choice. We decided the cafe was the best bet as otherwise we’d have to find somewhere to eat what ever we bought at the boulangerie. So we dripped in only to find lots of other walkers. So this is where they all were. The were wet, yes, but not muddy – how come? Well they were all walking on the road!! Apparently they’d asked about the path and were told it was impassable! Well that’s not quite true, it’s very muddy but you can get through. 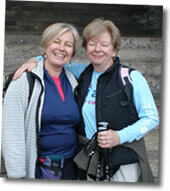 Teresa and I laughed as it had never ever occurred to us that we should question the Camino at all. As far as we were concerned, we were here to walk the path and that’s just what we were doing. Also road walking doesn’t appeal at all. The roads are fairly busy with lots of lorries whereas the paths are much pleasanter even if muddy. So as our fellow walkers bid us farewell, Teresa and I’s plans to continue on the path stayed resolute…..and we felt rather proud that we were walking the path. It was bliss to sit in the cafe and have hot chocolate and then when we had dried out a little, to have another with a delicious sandwich. Soon though, it was time to head out into the rain again. One last trip to the loo and then pull on the waterproof trousers and kagouls again, hoist on the day packs and leave. Could it get any worse? Yes, heavier and heavier rain with torrents at times that just appeared out of nowhere. In situations like this we just tended to laugh, well what else do you do? Actually at times like this, I was so grateful for having company, it would have been so much harder on your own. Further on and we were heading downhill, Teresa was ahead of me when she turned and pointed to the bottom of the hill where the path was no a churning mass of muddy water – perhaps it was impassable after all. Clearly the stream which went under the path via a pipe had overflowed and we had no idea at all whether what was ahead was ankle deep, knee deep or waist deep. I was trying to work out in my head how we might get across this without being washed away. We could see the path on the other side but how to get there? The field on our right had a grassy boundary round it so we started off on that with the stream on our left, well I should say raging torrent, and we were looking at ways to cross this. Soon though we gave up. We could still see the path on the other side and then ahead could see where the field bordered the road which crossed this stream via a small bridge so that was what we’d do and then hope that we could walk back across the field on the other side and pick up the path. Luckily, it went as planned and then a couple of kms further on, on a very steep path down, we had, what can only be described as a biblical downpour!! Thanks. Today was really just about getting from one place to the next so we just kept wishing that our arrival in Nogaro would come asap. We knew that the hotel was a little outside the town an near the race track but it was one of those situations where we kept thinking “that building must be it” but it wasn’t. It was quite a smart looking hotel and here we were arriving soaked through and caked with mud and even though walkers stay here regularly, they were not at all equipped for those arriving soaked through. There was no where to put our stuff other than in our bedroom so the place soon resembled a Chinese Laundry with damp clothes strewn everywhere. It was so good to get out of these clothes and to have a hot shower and then to feel clean and dry. Feeling like new, we treated ourselves to a couple of beers relaxing in the bar, laughing and reminiscing about our day. Dinner was fabulous – salad with gisards followed by duck with potatoes in garlic, tomato and pesto and for desert, brioche with prunes, raisins and cream. So yummy. Bed after that and lights out at 10.00 and this was a late night for us! !